This magical locomotive carries Hogwarts students non-stop from Platform 9-3/4 located at Kings Cross Station in London to Hogsmeade Station outside of Hogwarts School of Witchcraft and Wizardry. The steam engine in the films is the GWR 4900 class 5972 Olton Hall which was originally built in 1937. The films locomotive carries an alternate headboard of “Hogwarts Express” on its smoke box but still retains the GWR number of 5972 and an alternate fitted nameplate for “Hogwarts Castle”. 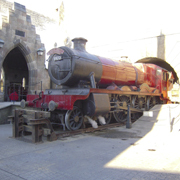 The coloring of the Hogwarts Express is a non-standard maroon color as Great Western Railway locomotives are traditionally Brunswick Green. Guests visiting the Wizarding World of Harry Potter will be greeted by the Hogwarts Express Train at the entrance of Hogsmeade. The train features “billowing steam and an iconic whistle”. You will even have the opportunity to meet the conductor and don’t forget to ask him for a picture as you make your way through the gates. He won’t mind posing for a shot or two in front of the magical locomotive.